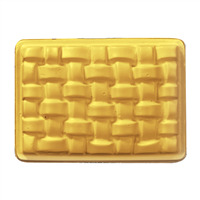 This Clamshell Soap Mold is rectangular with a basket weave pattern on the front. Use this clamshell mold to pour and package! Great for lotion bars and soap. Holds 3.7 ounces. Made in the U.S.A. Maximum pour temperature: 180º F.
COMMENTS: Love this mold for my men's shave soap and any other soap, really! Easy to use and attractive to the eye! COMMENTS: This makes such a beautiful bar of soap and my customers love this design. I in old the soap and wrap myself. Pretty inexpensive and versatile. COMMENTS: Great presentation for beginners like me. No brainer, just dont over load or snap lid on too soon! COMMENTS: My customers love this design. I used it in cold process and then ruined them in Hot process. Yesss, I loved this mold so much I risked using it in Hot Process. Well I figured they were cheap enough to replace. I will be ordering more. I wish this design could be ordered in silicone. COMMENTS: I make cp and mp with these. Both soaps release fine for me after in the freezer for 1/2 hour. I massage the mold a little and the soap comes out. I realize these molds are made for one time use as display, but I've used them over again. I added ground luffa which matched the basket design. Very cute. COMMENTS: I have used these since they first became available. They are a great seller. My customers love the basket weave pattern this makes on the soap. They like the fact that these can be reused and are great for travel. "What is the available size for label space on this package? " Staff Answer We are assuming you would like to label the back of the clamshell. This label area is 2.5" wide and 3.5" long. "It says one set.... What does that mean? how many are in this set? Or does it just mean one...cause 95 cents for a set is awesome haha"
Staff Answer One set means 1 clamshell soap mold with 1 back. Staff Answer Clamshells are intended to be used as a single use product. You pour the soap into the clamshell, apply the back and store the soap in the clamshell for future use. It is a great way to cut labor costs because your mold is the package. In saying that, we often hear these are made so well made that people use them as a traditional mold. These can be reused and I think they would work very well as a regular mold! Clamshells can be reused. 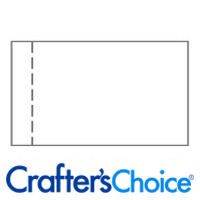 You can use them for molds or product packaging. You can reuse them if you really want to, but they are intended to be disposed after use. They can be reused, but if you are looking for a reusable product that will last I personally prefer silicone molds. "If I pour over the maximum pour temperature (180º F), what will happen? " You can warp the clamshell, or melt a hole straight through it! If you pour over the max temp your clamshell will melt or break. Depending on how much over the maximum temperature you pour, the clamshells will bend and warp preventing the tops from being placed on properly. "What is the recycle number for your Clamshells?" "Do the soap clamshells have a hinged lid?" The clamshells do not have a hinged lid. The mold and the lid are two separate pieces. The pieces do fit together well and it is great effortless packaging! WSP clamshells do not have hinged lids. The mold and the back of the mold are two separate pieces.